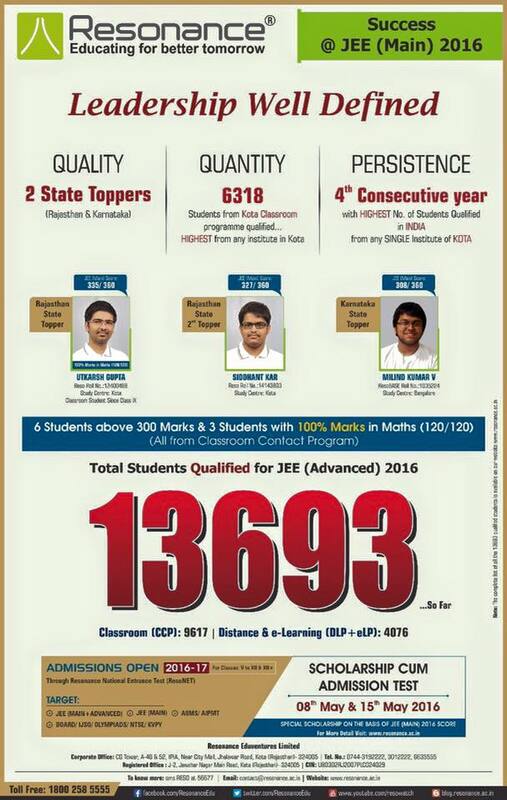 Total 13,693 Reso students have qualified for JEE (Advanced) 2016 so far. Total 9617 Reso students qualifies from yearlong classroom program (YCCP) of Resonance. 467 Students have qualified from Reso BASE in Karnataka. 4076 Reso students qualifies from distance learning and e-learning programme (Dlpd+ eLPD) of Resonance. Another astonishing achievement with 95% students (52 out of 55) qualifies for JEE Advanced 2016 from JNV Bundi. 6 Reso students scored more than 300 marks out of 360 and 3 students scored 100% Marks (120/120) in Mathematics. All the students are from Resonance yearlong classroom programme. Utkarsh Gupta is Rajasthan topper with 335 marks out of 360 followed by Siddhant Kar as Rajasthan 2nd topper with 327 marks out of 360. Both the students are from yearlong classroom contact programme of Resonance Kota. Milind Kumar Vaddiraju is Karnataka Topper with 308 marks out of 360. Mr. R.K. Verma (MD – Resonance) says that in JEE (Main) 2016 , total 12,921 students of Resonance qualified for JEE (Advanced) 2016 , Which is tremendous performance ,achievement and result of hard work of students and expert faculty of Resonance . This year, around 13 lakh students from all over India appeared for JEE (Main). Around 2 lakh students will qualify for JEE (Advanced) 2016 through their selection in JEE (Main) 2016. In JEE (Main) 2016, the cut-off for JEE (Advanced) 2016, for General category 100, for OBC category is 70, SC category is 52, for ST category is 48. C.B.S.E. , New Delhi will generate a separate preference list for National institute for technology (NITs) and other premier engineering colleges. This preference list will be prepared based on the combined score of students including 60% weightage of JEE (Main) marks and 40% weightage of class 12th Board percentage. This tremendous achievement called for a great celebration at C.G. tower where all the students and faculties rejoiced this great moment by dancing. Resonance congratulate all the students qualified for JEE (Advanced) 2016 and wish them all the best for the exam to be conducted on 22nd May 2016. Last year, the Institute registered 4124 selections in JEE Advanced 2015 (2570 from classroom and 1554 from distance learning). This feat is best in whole India from any Single Institute of Kota and Resonance repeated it consecutively for third year. Total 11 ranks from Classroom Courses are in Top 150.